Our Australian Registered Migration Agent, Hannibal Khoury, will be in Hobart, Tasmania. He will be covering the current trends in Australia, what is takes to get a visa, and the work/life opportunites that are available for all seeking a stable and positive labour market. This is a great opportunity to learn what the process entails whilst gaining an insight on the lifestyle, jobs and opportunities in Australia. Don’t miss out on the chance to speak about your aspirations to live in Australia. Hannibal has been a registered migration agent for over 15 years. He is able to can offer you an insight on your migration options, pathways and how you can position your application to obtain a favourable outcome. The 1 hour consultation will enable you to ask all the hard immigration questions, discuss the process, as it applies to you, in depth. We will be offering individual one-to-one consultations in Tasmania for would be migrants. Please contact us with your details to book an individual consultation. During the festive season, Thames Migration offices in both Australia and the United Kingdom will close from Friday 22 December 2017 and reopen on Tuesday 2 January 2018. From the entire Thames Migration team, we wish you all a merry feastive season and a Happy New Year! Originally from Lebanon, Erica and Naji Rizk of The Rustic Fig Cafe say Adelaide’s secret charm and idyllic lifestyle won them over. After deciding to make the big move to Australia from the bustling lifestyle of Lebanon, Erica, Naji and their two teenage children had only the city to decide on. While considering Hobart, Brisbane and Perth initially, they say they were drawn to Adelaide’s appealing lifestyle – an unexpected but welcome surprise. He and Erica say it was a suggestion from a migration agent (namely, Hannibal Khoury – Thames Migration) that led them to Adelaide. “We could see it would provide the lifestyle change we were wanting for us and our children,” Erica says. While many of their friends had already settled in Brisbane and Perth, the family made the bold move to call Adelaide home – a surprise to many of their family and friends. But the move has paid off for the family, settling into their new life happily, and with some exciting changes too. Not only has school proved a seamless transition for the kids, but so too have extra-curricular activities. Their son has joined a local soccer club while their daughter has immersed herself in charity work as an ambassador with the Australian Refugee Association. But it’s not just the kids’ lives that have been through a transition. The Rizks have also embarked on another enormous journey with their move – starting their very own business. Now the proud owners of Erindale cafe The Rustic Fig Cafe, Erica and Naji say that the assistance provided by Immigration SA really helped to facilitate their dream. After attending an information session run by Immigration SA, the pair were inspired by guest speakers to embark on their own business journey. 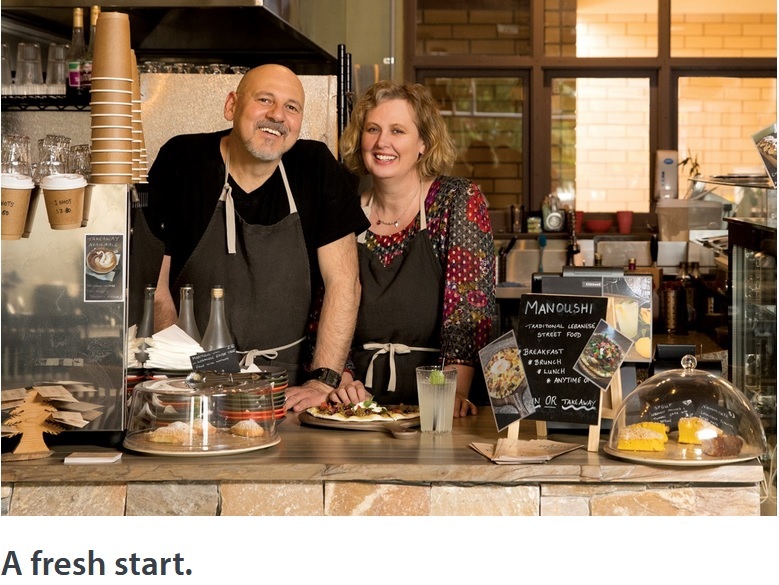 Business advisors from the Business Enterprise team at Adelaide City Council further encouraged the couple, offering advice and support in beginning their new cafe. Now employing two further staff, the bustling cafe provides the ultimate career and lifestyle change for the Rizks, and they’ve never looked back. With a focus on Lebanese street food, utilising local Adelaide Central Market ingredients, the business has also been a way for the family to maintain and share their culture in their new Adelaide home. While they would recommend the move, they say they don’t want too many people to know about their new hidden gem of a home. Exemption from English language test on the basis of salary removed. *Completed a minimum of five years of full-time study in a secondary and/or higher education institution where the instruction was delivered in English. Exemption from providing an English language test for applicants whose salary is in the top tax bracket removed. For further information or any questions, please contact our staff in Australia or the United Kingdom to learn more. There is about to be a major change to the way partner visas are processed splitting the process into 2 distinct and separate parts. Prior to these changes an application consisted of a sponsorship application by the Australian half of the relationship together with a visa application by the other partner and dependants. These processes from the 1st of July will now be considered separately on their own individual merits. From this date, the Australian sponsor of the Partner visas will be required to apply for, and be approved as a sponsor before the visa application is lodged. If for any reason the sponsorship is not approved (the sponsor for example, is found to not be of good character) then the visa application cannot be made. There is no indication yet as to what fees will be charged or the exact requirements that sponsor and applicant will have to meet, though they will in all probability have at least to meet the current standard. Whether additional criteria will be set for sponsor or applicant is not yet known. The other unknown at present is how long it is going to take to complete this new process. There will also be obligations on the sponsor to notify of any changes in circumstances and failure to do this will most likely result in penalties. ​Everyone who wants to enter or stay in Australia must satisfy the character requirement as set out in Section 501 of the Migration Act 1958 (the Act). This includes all non-citizens, sponsors of visa applicants and non-migrating family members seeking to enter or stay in Australia. consent to us disclosing their convictions for relevant offences to the visa applicant(s). Furthermore, when applying for a Partner visa, if you do not inform the DIBP of your criminal history, your visa application may be refused. A refusal can occur via Public Interest Criterion (PIC) 4020. PIC 4020 enables refusal of a visa if an applicant provides a bogus document or information that is false or misleading in relation to their application, or if the Minister is not satisfied of an applicant’s identity. Given the new arrangements there is a very real risk that additional delays will be introduced when the system is changed leading to an increase in the time it will take to apply for and complete the partner visa process. It is noteworthy to mention that the 1st July is the start of the new Financial Year in Australia and traditionally when changes to pricing and visa requirements are made. There is every indication this year that there will be significant changes to a number of visa programs including 457 employment visas and the Skilled Migration program. Traditionally, at this time fees are increased in line with inflation but there have been a number of notable years where fees for some visas have risen substantially above this figure. Again traditionally the new fees and regulations are often published for the first time on the 1st July on the Department’s website. Thames Migration suggest that if you are considering applying for an Australian Partner visa (Subclass 309/100) or (Subclass 300) or (Subclass 801/820) and you are eligible now, it would be wise to apply sooner rather than later, before 1 July 2017. Contact Hannibal Khoury, our Australian Registered Migration Agent who specialises in Australian Partner visas from the United Kingdom to Australia. Thames Migration is the leading Australian visa agency in London, United Kingdom offering all Australian visa and immigration services. Jobs in Australia – This Open Day is designed for all ages from 18+. Australia is undergoing a number of changes across the board. If you are seeking to make Australia home, or even just wanting to explore Australia for a year to ‘try before you buy’ then this seminar is for you! Can’t make it? We will be offering individual one-to-one consultations until the end of May for FREE! (usually £150 +VAT). Please contact us with your details to book an individual consultation. For more specific information regarding applications submitted by Thames Migration, please contact us directly on 02089960120 in the United Kingdom or on 0412525232 in Australia. Effective from 1 November 2016, subclass 462 Work and Holiday visa holders will be eligible to apply for a second Work and Holiday visa if they have worked for at least 88 days or 3 months in the agriculture, forestry, fisheries, tourism and hospitality industries for northern Australia. Northern Australia in this aspect includes all of the Northern Territory, and northern parts of Western Australia and Queensland. Please be aware that the subclass 462 (Work and Holiday) visa is different from the subclass 417 Working Holiday visa. With the changes introduced the subclass 462 (Work and Holiday) visa will be on par with the subclass 417 Working Holiday visa which allows for visa holders to apply for a second visa to extend their stay in Australia. The move will designed to also provide a boost to regional Australia tourism and employers who find it difficult to find help in the bush or the outback.